Amazingly, the history of International Watch Company (IWC) Schaffhausen, one of the premier Swiss watchmakers, began right here in Boston over 140 years ago. Florentine Ariosto Jones was a 27 year-old watchmaker and engineer, as well as the manager of the E. Howard Watch and Clock Company in Boston, one of the leading American watchmakers. Young Ariosto had an amazing entrepreneurial vision â to utilize the incomparable craftsmanship of the Swiss horologists combined with cutting-edge technology to produce the finest quality of watches for Americans. His idea was to transform the small Swiss workshops that had been extant since the 17th century, into a modern factory with a centralized production method. To Jones' dismay, most of the Swiss professionals looked askance at the idea â reticent to move their industry into the then modern 19th century. But then he was introduced to Heinrich Moser, an industrialist from Schaffhausen, the center of one of the oldest clock-making areas on the Rhine, where the local monastery had produced the earliest clock on record in 1409 for the church of St. John. Schaffhausen is a picturesque town from the middle ages in far Northern Switzerland, in a canton named the same. It's across the river from Germany. There are official records of a clockmakers guild in Schaffhausen since 1583, and it was also home to the famed Habrecht family of horologists, who built one of history's most outstanding astronomical clocks for the Strasbourg cathedral. Nevertheless, it was Jones's plan to manufacture relatively large numbers of high-quality watches in-house to precisely the same tolerances, which enabled timepieces that were made in the town of Schaffhausen to become famous all over the world. The current IWC, owned by Richemont Corporation since 2000, produces some of the most beautiful, complicated, and ultra-functional watches in the world. Their craftsmanship, technology, and incredible designs put them in an exalted group of watchmakers. The irony stands that despite Florentine Jones' very modern American vision of mass manufacture, IWC continues to produce precision watches with old-world Swiss craftsmanship, with several models more affordable than other equitable brands. 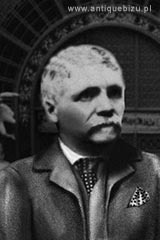 27 year- old Florentine Ariosto Jones from Boston, Massachusetts (1841-1916), founded IWC in Schaffhausen in 1868. His vision was to make superior quality pocket watches for the marketplace in the United States. After seven years of early successes, Jones built a new manufactory on the banks of the River Rhine in 1875, which employed 196 people. Five years later, in 1880, Jones sold IWC to Johannes Rauschenbach-Vogel (1815-1881), an industrial engine manufacturer in Schaffhausen. A year later, Rauschenbach-Vogel died, and IWC was passed down to his son, Johannes Rauschenbach-Schenk (1856-1905), who proved to be an innovator. In 1885, IWC introduced the Pallweber system, the first timepieces with digital minute and hour displays. In 1887 they produced the Magique timepiece, with a cabriolet case and a 24-hour indicator that functioned as both an open-face and a hunter. In 1899 they debuted one of the first wristwatches, with the diminutive, 64 calibre ladies' pocket watch movement in a lovely case attached by lugs to a leather band. The 63 calibre movement was also used for additional watches. Big Pilot's Watch 52 T.S.C. Johannes Rauschenbach-Schenk's daughter, Marie (1882-1955), married the pioneering psychiatrist C. G. Jung in 1903, while her sister, Bertha Margaretha (1869-1955), wed industrialist Ernst Jakob Homberger (1869-1955) that same year. Both sons-in-law were presented with their wives' interests in the company as dowries, and in 1905, when Johannes Rauschenbach passed away, Homberger represented the family, taking the reins of IWC and beginning an era that lasted until 1944. IWC designed their first movements for wristwatches in 1915. The 75 calibre movement had no seconds, but the 76 caliber included a small seconds display. In 1929, Ernest Jakob Homberger bought out the holdings of Carl Jung, becoming the sole owner of the company. 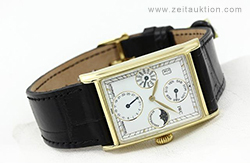 IWC produced a rectangular shaped movement, the 87 calibre, to run their elegant new tonneau watches in 1931. In 1936 they launched the Special Pilot's Watch, with an arrowhead index on a rotating bezel that indicated the takeoff times. 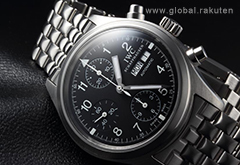 In 1940, with World War II beginning in Europe and Asia, aviators bought the IWC Big Pilot's Watch 52 T.S.C. with an essential central seconds hand. 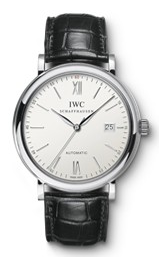 In 1944 IWC created their W.W.W. wristwatch for the British Army. Standing for "Watch, Wrist, Waterproof," The three W's were engraved on the backs of the cases along with the royal arrowhead insignia. That year, engineer Albert Pellaton (born in 1898) became the technical director at the company. Pellaton's first watch design, the 89 calibre, was introduced in 1946. It was extremely accurate and contained a central seconds hand. 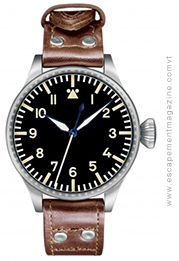 The Pilot's Watch Mark 11 debuted in 1948, also utilizing the 89 calibre movement. It had a soft-iron inner case that provided extremely efficient anti-magnetic protection for scientists, pilots, and technicians. The 85 calibre movement was introduced in 1950 â Albert Pellaton's first automatic wound mechanisms â with his innovative Pawl-winding system instead of the traditional reciprocal gears. Ernest Jakob Homberger's son, Hans Ernest, took over IWC in 1955; his era lasted over two decades and he was the last private owner of the company. The first Ingenieur (ref 1832) automatic winding watch also debuted that year. 1959 saw the introduction of IWC's first automatic movement for women â the 44 calibre. In 1967 the company began their successful line of professional diving watches with the Aquatimer, which was water-resistant to an extremely deep 20 bar. In addition, the company's elegant Yacht Club Automatic was premiered at the Basel watch show. IWC developed their revolutionary Beta 21 quartz movement in 1969; it ran at an incredibly high frequency of 8192 hertz. Their first Beta 21 watch was the Da Vinci. In 1976 they debuted their updated Ingenieur SL. In 1977 the complicated 9721 calibre was unveiled â their first pocket watch with moon phase and calendar displays, with some that were skeletonized. In 1978, the company, in co-operation with automobile designer F.A. Porsche, created the first wristwatch with a built-in compass. Also that year, German instrument manufacturer VDO Adolf Schindling AG acquired IWC, owning it until the turn of the 21st century. In 1980, F.A. Porsche also designed the world's first titanium-case chronograph for IWC; the watchmaker engineered its process for machining the high-tech metal by consulting with technology specialist AÃ©rospatiale. The exceptionally durable Ocean 2000 diver's watch was launched in 1982, made of titanium and pressure-resistant to 200 atmospheres. IWC introduced the Da Vinci in 1985, the first chronograph with a crown-set perpetual calendar programmed for 500 years and a four-digit year display. The company started utilizing scratch-resistant zirconium oxide as a case material in 1986; it was a virtually unbreakable ceramic alloy. In 1987, IWC debuted their Novecento (ref 3545), meaning "20th century" in Italian, a rectangular, automatic, water-resistant watch that included a perpetual calendar complication. In 1990, after 7 years in the making, the company took a quantum leap in precision horology with their Grande Complication (ref 3770) chronograph wristwatch that included a minute repeater, moon phase display, and perpetual calendar. In 1993, IWC's ultimate creation, Il Destriero Scafusia ("The Warhorse of Schaffhausen") was produced for their 125th anniversary. It was the world's most complicated wristwatch made in an edition of only 125 examples that included split seconds, a tourbillon, a minute repeater, and a perpetual calendar. Also manufactured in a special edition of 125 was their large caliber, high precision Portuguese watch. The Pilot's Watch Mark XII (ref 3241) was introduced in 1994, the new incarnation of the now legendary Mark 11. In 1995, to celebrate the decade anniversary of their automatic Da Vinci, IWC made it a split seconds chronograph (ref 3751). That same year they debuted their amazing Portuguese Chronograph-Rattrapante (ref 3712), a large caliber chronograph also with a split seconds hand, as well as their new Portuguese Minute Repeater (ref 5240). The company's new GST sports watch (ref 3536) collection was introduced in 1997, and in 1998, they unveiled the Pilot's Watch UTC (ref 3251) (Universal Time Coordinated) that had a twenty-four hour display and an hour hand that could be adjusted in one-hour steps. To cap off the century, the GST Deep One (ref 3527) diving watch that included a precision depth gauge debuted in 1999. The new century and new millennium began the Richemont era at IWC, the current owners of the company. The year 2000 brought their extra large 5000 calibre watch that ran non-stop for 7 days and featured a power reserve indicator as well as a Pellaton automatic winding mechanism. The in house movement was designed for their large wristwatches as huge, 40 mm. cases became internationally popular. GÃ¼nter BlÃ¼mlein (1943-2001), the IWC Chairman of the Board of Directors, died in 2001. He had made an enormous impact on the company's contemporary development. The company renewed its tradition of the Big Pilot's Watch (ref 5002) in 2002, introducing a new version with automatic winding, a 7-day power reserve and display, and date indicator, which stirred tremendous excitement at the Salon International de la Haute Horlogerie (SIHH) in Geneva. In 2003, the Portuguese Perpetual Calendar (ref 5021) with its exclusive hemispherical moon phase display was unveiled, along with their new Spitfire collection of pilot's watches that commemorated the WWII British fighter plane. The company relaunched their Aquatimer line in 2004, while at the same time they expanded the Portuguese family with the additions of the Portuguese Automatic (ref 5001), the Portuguese Minute Repeater Squelette (ref 5241), and the exquisite Portuguese Tourbillon MystÃ¨re (ref 5042). That same year also saw new additions to the Portofino and Da Vinci collections. 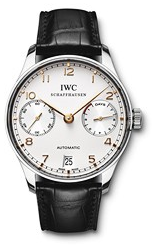 There were ten IWC unveilings in the banner year of 2005, including new models for the Da Vinci and Portuguese lines. In addition, they brought back the Ingenieur watch in three new versions. The new East Annex of the company's manufactory in Schaffhausen was also officially opened. 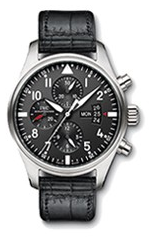 In 2006, IWC introduced five modified selections of pilot's watch, including the Updated Big Pilot's Watch (ref 5004) and the Pilot's Watch Chronograph (ref 3706). The models of the Spitfire line, such as the Spitfire Chronograph (ref 3717) were also reworked into a larger size. 2007 marked the debut of the beautiful tonneau-shaped Da Vinci collection; the chronograph was given a completely new in-house manufactured movement. They also unveiled the Da Vinci Perpetual Calendar Edition Kurt Klaus (ref 3762), named for the engineer who invented the first calendar upon his golden jubilee with the company. Other new models included the Big Ingenieur 7 Day Automatic (ref 5005) and the Spitfire Double Chronograph (ref 3712). That summer, the new watch museum opened in Schaffhausen, in the old factory that had been elegantly remodeled with modern, beautifully illuminated exhibits, including a striking multimedia presentation showing the history of the company. 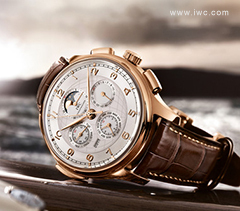 2008 was the 140th anniversary of IWC. An exclusive vintage collection was introduced honoring the founders of its six watch families, and the new West Annex constructed for the watchmakers was completed and initiated. A new generation of Aquatimer diving watches was presented in 2009, as well as their well-publicized premier of the spectacular Da Vinci Perpetual Calendar Digital Date-Month (ref 3761) with its large-numeral digital display for the month and date. Several new models of the Portuguese collection were introduced in 2010; the Portuguese Tourbillon MystÃ¨re RÃ©trograde (ref 5044) included the flying Tourbillon with a retrograde date display. The Grande Complication (ref 3774) debuted in a new Portuguese case, as did the new, sporty Portuguese Yacht Club Chronograph (ref 3902). Also unveiled was the innovative Da Vinci Chronograph Ceramic (ref 3766) with its case fashioned from a rugged, high-tech titanium and ceramic alloy with a fantastic three-dimensional chapter ring that seems to levitate above the dial. In 2011, the company unveiled its reworked its elegant Portofino watch line with classical Italian styling. The Portofino Hand-Wound Eight Days (ref 5101) included a new in-house manufactured 59210 calibre movement. The Ingenieur Double Chronograph Titanium (iw 3765) had a titanium case, split seconds hand, and durable rubber strap. That August, IWC presented the most ultra-exclusive and complex watch to ever hail from Schaffhausen â the Portuguese SidÃ¨rale Scafusia (ref 5041). It was introduced at the European Southern Observatory (ESO) on Cerro Paranal, Chile, and included their patented constant-force tourbillon and some other formidable complications such as individually calculated astronomical displays. Each example was unique and created specifically to order. 2012 saw the introduction of five, exciting TOP GUN (ref 3789) watches. The TOP GUN Miramar (ref 3880) line had a distinctive, military design in their long tradition of manufacturing deck watches. The elegant Spitfire collection was enhanced with the luxurious Spitfire Perpetual Calendar Digital Date-Month, and the Classics collection with its aeronautic cockpit-style look, unveiled its Pilot's Watch World Timer (ref 3262) in the UTC Pilot's family. The Ingenieur family of 11 self-winding watches premiered in 1955 and has a classic five-lug Gerald Genta oyster-style case. An Automatic (ref. 3227). movement with a simple three hand design and date window at 3 o'clock is made in stainless steel with an inner iron case that is anti-magnetic, with a matching stainless bracelet There are several chronographs, including the Double Chronograph Titanium (ref. 3865, 3765), the Chronograph Silberpfeil with a flyback function (ref. 3785), and the dynamic Chronograph Racer with stopwatch and flyback (ref. 3785). Two ultra-high tech Ingenieur designs are the Automatic AMG Black Series Ceramic (ref. 3225), and the limited edition Automatic Carbon Performance (ref. 3224). The Dual Time Titanium indicates two local times (ref. 3264), and two complicated Ingenieur models include the Perpetual Calendar Digital Date-Month (ref. 3792), and the elegant Constant Force Tourbillon (ref. 5900) with a platinum and ceramic case. Also noteworthy is the Automatic Mission Earth (ref. 3236), built for extreme sports with a built-in shock absorber system and anti-magnetic resistance to fields up to 80,000 Ampere/meters. The round case design Portuguese family, initiated in 1939 by IWC to honor Portugal's great seafaring explorers like Vasco da Gama, Ferdinand Magellan, and Bartolomeu Dias, has 14 elegant models that reference the tradition of nautical instruments with contemporary designs and movements. There is a formidable range of complications. The classic Portuguese Automatic (ref. 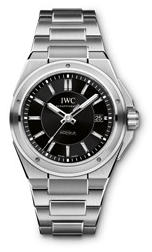 5001) has a power reserve and date display in 18K red or white gold, and stainless steel. The Portuguese Hand-Wound (ref. 5454) is for purists, a simple watch with a separate seconds dial that's available in stainless and 18K red gold There are five chronographs in either stainless or red gold, each accurate to Â¼ of a second. These include the Portuguese Chronograph (ref. 3714), the elegant Portuguese Yacht Club Chronograph (ref. 3902) with flyback function and rugged rubber strap, the Portuguese Grande Complication (ref. 3774) with a minute repeater and perpetual calendar in an edition of 100 , the Portuguese Chronograph Classic (ref. 3904) with hour and minute totalizer and flyback function, and the stainless Portuguese Yacht Club Chronograph Edition "Laureus Sport for Good Foundation", (ref. 3902) with a portion of the proceeds going to the Laureus Foundation for disadvantaged children.The magnificent, platinum, 18K red or white gold Portuguese Siderale Scafusia (ref. 5041) is hand-wound with IWC's first constant-force tourbillon, a perpetual calendar, and a customized celestial chart on the verso of the case that does the astronomical calculations customized to the owner's location. The stainless Portuguese Automatic Edition "Tribeca Film Festival 2013" (ref. 5001) is a special edition of 100 examples with small seconds and power reserve dials in a claret-red color and a slate dial. The Portuguese Tourbillon Hand-Wound (ref. 5454) comes with a flying minute tourbillon at 9 o'clock, in white or red gold. The Portuguese Tourbillon MystÃ¨re RÃ©trograde (ref. 5044) is a limited edition of 250 examples in platinum, and 500 watches in 18K red gold, with power reserve and retrograde date displays, and the tourbillon at 12 o'clock. The Portuguese Grande Complication (ref. 3774) is extraordinary, with a perpetual calendar programmed to the year 2499, a perpetual moon phase display, a minute repeater, and a chronograph in red gold or platinum. The Portuguese Minute Repeater (ref. 5449) has a slider that causes the strike train to chime the time in hours, quarter hours, and minutes â available in 500 examples in platinum, and another 500 in red gold. The Portuguese Perpetual Calendar (ref. 5023) in platinum (250 pieces), red, or white gold, has a perpetual calendar with displays for the day, month, date, and year in four digits, a power reserve indicator, and a perpetual moon phase. These four, tonneau-shaped, smaller watches celebrate Leonardo Da Vinci and the spirit of technical innovation. The Da Vinci Automatic (ref. 4523) in rose gold or stainless steel has time and a date window at 3 o'clock. The sophisticated self-winding Da Vinci Chronograph (ref. 3764) contains a stopwatch function with minutes, hours, and seconds, date display, flyback, and hour and minute counters in a single totalizer at 12 o'clock. It's available in 500 pieces made of platinum, red and white gold, and two models in stainless steel. The Da Vinci Perpetual Calendar Digital Date-Month (ref. 3761) in rose gold has large double window displays for the date and month, a perpetual calendar with crown activated rapid advance, a leap year display, a stopwatch function with minutes, hours, and seconds, and a flyback function. The Da Vinci Perpetual Calendar Edition Kurt Klaus (ref. 3762), named after the IWC designer and inventor who was with the company for 50 years, comes in red gold or stainless steel, with perpetual calendar with crown-activated rapid advance, four digit year display, perpetual moon phase, day, date, and month indicators, and a full stopwatch function with hours, minutes, and seconds. There is an elegant, engraved portrait of Klaus on the verso. There are three models of Portofino's, named after the center of the Italian-international jet set. These beautiful round-case watches include the classic Portofino Automatic (ref. 3565) with hours, minutes, seconds, and date display, in 18K red gold or stainless steel with the ultra-comfortable Milanese mesh bracelet. The self-winding Portofino Chronograph (ref. 3910) in four variations of stainless steel has a chronograph with full stopwatch functions, and a small hacking seconds display, with leather band or the Milanese mesh bracelet. The Portofino Hand-Wound Eight Days (ref. 5101) in red gold or stainless steel includes a power reserve display and small hacking seconds indicator. These five marine watches are among the finest and most rugged in the world. 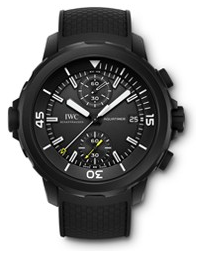 The self-winding Aquatimer Chronograph Edition Galapagos Islands (ref. 3767) with stainless steel case and matte-black rubber coating and bracelet, contains a date and day display, a full stopwatch function, small hacking seconds indicator, and external rotating timing bezel. The Aquatimer Chronograph (ref. 3767) is offered in four stainless steel variations, with rubber or matching steel bracelet. It includes a date and day display, full stopwatch function, small hacking seconds, and luminescent elements on the hands, dial, and external rotating timing bezel. The Aquatimer Automatic 2000 (ref. 3568) for deep diving is pressure resistant to a depth of 200 atmospheres, and includes a date display and central hacking seconds, with the luminescent elements on hands, dial, and the external rotating timing bezel, in four variations of stainless steel with matching steel or rubber bracelet. The elegant, self-winding Aquatimer Chronograph (ref. 3769) in 18K red gold and distinctive black face and black rubber strap has a stopwatch function, hour and minute counters combined in a single totalizer at 12 o'clock, flyback function, and small hacking seconds. The Aquatimer Deep Two (ref. 3547) is available in stainless steel with matching bracelet or rubber strap. It has a date display, central hacking seconds, a mechanical depth gauge with split indicator showing maximum depth to 50 meters, and the luminescent elements and rotating bezel. 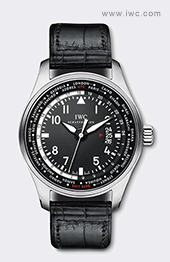 IWC expanded this historical collection to 15 models in 2012. The self-winding Pilot's Watch Chronograph (ref. 3777), with its cockpit-instrument style, is made in stainless steel with either a matching bracelet or leather band. It has a date and day display, small hacking seconds, a full stopwatch function with hours, minutes, and seconds, and a soft-iron inner case for protection against magnetic fields. The simple, large numeral Pilot's Watch Mark XVII (ref. 3265) is also made in stainless, with metal bracelet or leather band, date display, soft-iron anti-magnetic case, and hacking seconds. The Spitfire Chronograph (ref. 3878) arrives in two stainless models and one in 18K red gold. It contains a date display, full stopwatch function, flyback mechanism, and small hacking seconds. The Pilot's Watch Chronograph Top Gun Miramar (ref. 3880) in a special ceramic and titanium case has the vintage anthracite dial with British Army olive strap, and gold luminescent elements. It has a date display, full stopwatch and flyback function, small hacking seconds, and the anti-magnetic soft-iron case. 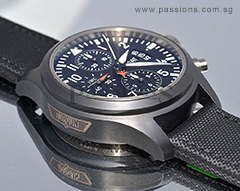 The Pilot's Watch Chronograph Top Gun (ref. 3880), the homage to the U.S. Navy's Top Gun fighter school, also arrives in the high-tech ceramic and titanium case and black, soft strap. It includes a date display, full stopwatch and flyback functions, small hacking seconds, and soft-iron anti-magnetic inner case. The Pilot's Watch Worldtimer (ref. 3262) in stainless with a black alligator strap, has a date display, central hacking seconds, a 24-hour world timer function, 24 time zone circumnavigating rail, and anti-magnet soft-iron inner case. The classic Big Pilot's Watch (ref. 5009) is 46 mm in diameter, in stainless with a riveted black alligator strap, date and power reserve displays, central hacking seconds, a GlucydurÂ® beryllium alloy balance with high-precision adjustment, and anti-magnetic inner case. The extraordinary Pilot's Watch Double Chronograph (ref. 3778) in stainless steel with black, riveted alligator strap includes date and day displays, small hacking seconds, full stopwatch function, split-seconds hand for intermediate timing, and an anti-magnetic inner case. The Big Pilot's Watch Top gun Miramar (ref. 5019) is ceramic and titanium, with the vintage anthracite dial and military green textile strap. It contains date and power reserve displays, central hacking seconds, and the GlucydurÂ® beryllium alloy balance. The 48 mm. Big Pilot's Watch Top Gun (ref. 5019) in ceramic and titanium with black soft strap has a date display, power reserve indicator, central hacking seconds, GlucydurÂ® beryllium alloy balance, and secured sapphire glass that resists high air pressure for jet fighters. The equally huge Big Pilot's Watch Perpetual Calendar Top Gun (ref. 5029) is also ceramic and titanium, with a power reserve display, a perpetual calendar with displays for the date, day, and month, a perpetual moon phase display, and double moon phase indicators for both hemispheres. The Pilot's Watches for Father and Son set consists of a full size Big Pilot's Watch, and a matching, smaller case Pilot's Watch Mark XVI (ref. 5009/3255). The magnificent Pilot's Watch Chronograph Edition Antoine de Saint-ExupÃ©ry (ref. 3878), an homage to the great aviator, poet, and pioneer, comes in limited edition18K red gold or stainless steel, with brown calfskin straps and distinctive chocolate dial. It has a date display full stopwatch function, combined hour and minute totalizer, flyback function, small hacking seconds, and crystal secured against drops in air pressure. The special 250-watch edition Big Pilot's Watch Edition Muhammad Ali (ref. 5004) is a tribute to the great fighter's 70th birthday. It comes in stainless steel with a black alligator leather strap with red calfskin lining, hour markers and hands. It has a date and power reserve display, central hacking seconds, and the GlucydurÂ® beryllium alloy balance. The elegant Spitfire Perpetual Calendar Digital Date-Month (ref. 3791) in 18K red gold and brown alligator strap has full stopwatch function, combined hour and minute totalizer, flyback function, perpetual calendar, small hacking seconds, a leap year display, and large double-digit displays for both the date and month.